What’s in my February Must Have Box? Hello there! I am back with another Popsugar Must Have Unboxing! FYI if you are new ..POPSUGAR Must have boxes are full of full sized lifestyle products! You can do a Quarterly subscription $75+ shipping or the Annual subscription for $270+ free shipping! I also have a $5 off code towards your first purchase at the end of this post. Now that I mentioned that let’s get into the unboxing.. I call this the “Love” box because it was full of lovey dovey items which was perfect for Valentine’s day! It’s the little things… I love how their box comes with details on every product in the box. The pricing and the websites for the items are a plus too. The first I am sharing with you is a candle! We all love candles right? Sets moods, helps calming, helps your environment smell fresh…I can go on. Thi is the K. Hall Designs Peony Jar Candle. It retails for $26 and smells absolutely amazing! The scent of Peony is one of my favorite scents in a candle. 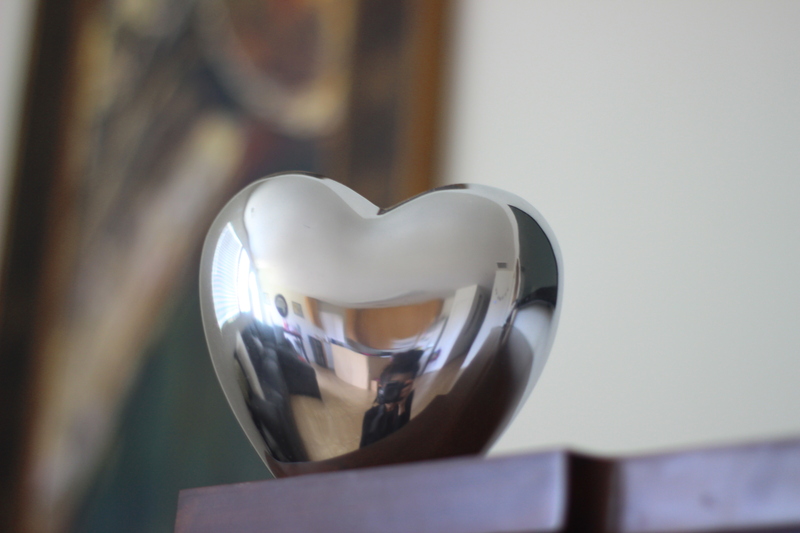 The heart vase! I fell in love with this. Such a beautiful piece of decor to have in your home no matter what month it is. It’s a metallic silver vase that can give that finishing touch in your office or home. With or Without flowers it will be a stand out modern piece. It’s also eco- friendly. Retails for $49. I love when Popsugar Must have boxes add jewelry. I am not one to go out and buy jewelry. One I don’t have time and two I just don’t think about it. So when popsugar must have boxes have jewelry I appreciate it and thank them in my head because then I get excited thinking of what I would pair the pieces with. For example this dainty bracelet by La Soula Jewelry is a perfect! It’s the universal love bracelet. Retails for $39. The band is adjustable and in the star it’s so cute because it has a beautiful tiny diamond. Another from TOKYOMILK. This time it’s a perfume! I know you can’t smell it and honestly I am not that great at describing scents but you can trust my word that this smells beautiful. Almost like cutie oranges. haha. Cutie oranges can be beautiful OKAY?! This is the french Kiss No. 15 Parfum that retails on their site for $30. Money on Honey! Love that name. I love me some chocolate especially chocolate with nuts OMG! I can’t even begin to tell you how delicious these dark chocolate are. DROOL NATION! They are droga Chocolates with honey- caramel. So good! So an extra special surprise came in this box! Its a set of Two Stella Artois Buy a Lady a Drink Limited Edition Chalices. Cheers! So every year Stella Artois partners with Water.org and have three artist from developing countries to come design limited edition chalices. I got the Mexico and Philippines one. The design is so well done and beautiful. So for every Chalice sold, Stella Artois and Water.org provide 5 years worth of clean water for someone in need. Pretty amazing right? Makes me happy sipping out of them now. Last Minute Gift Ideas For Kids!